Coaraze is a small 'perched village' in the hills north of Nice, in the Alpes-Maritimes department of Provence, south-east France. 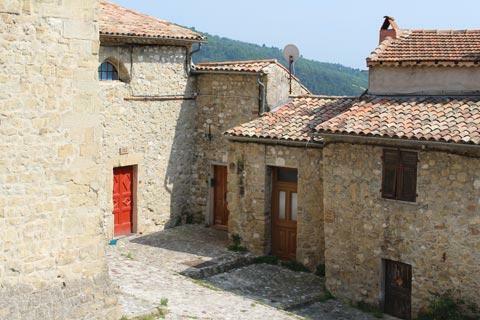 Officially classified as one of the 'most beautiful villages in France', Coaraze is in a lovely setting running up the side of a hill with mountains rising dramatically behind the village. 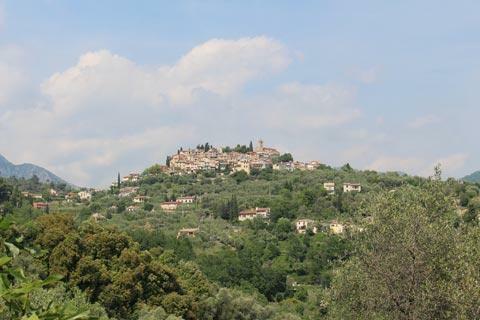 Because of its sheltered position and its remarkable number of sunny days each year the village is referred to locally - and in particular in tourist literature! - as the Village du Soleil (the Village of Sun). 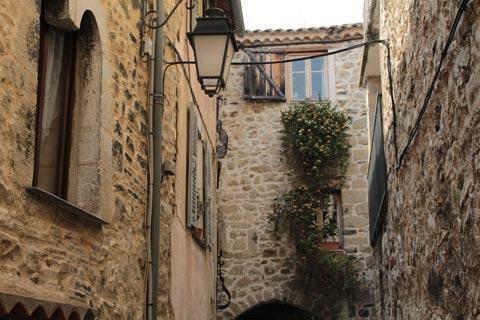 Despite its proximity to Nice and its 'most beautiful village' classification, the slow route to reach Coaraze ensures it becomes less crowded than many of the more accessible beautiful villages in the Alpes-Maritimes. It should also be noted that the route from the coast to Coaraze passes through quite a lot of industrial development so is rather less picturesque than you might expect until you get close to the village. France This Way comment: although Coaraze is quite a pretty village we also found it rather neglected with, for example, broken furniture in the main square, little atttention to flowers and plants and a public garden that was too overgrown to get in to, and a general lack of attention to the village. Hopefully a temporary phenomenon, but we would recommend you visit if passing but not travel a long way to visit (note: for comparison we have visited more than 80% of the 'most beautiful villages in France'). Stop in the Coaraze tourist office for a village guide when you arrive to make sure you don't miss any of the little features and architectural highlights. 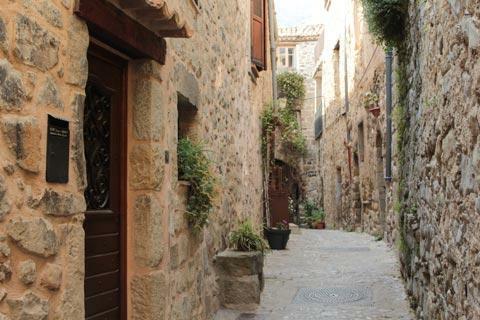 There is a lovely medieval centre in the village which is easy to explore - simply walk up through the village along the narrow cobbled streets lined with old houses that meander towards the top of the hill. 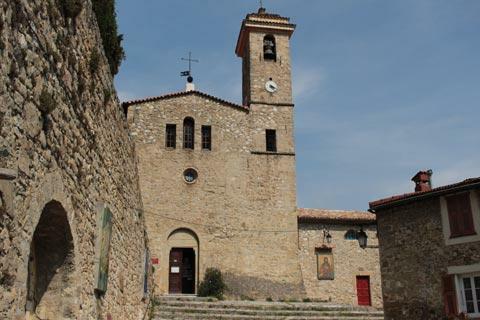 En route you will see many lovely buildings, some in stone and others painted in pastel colours, and pass through quiet vaulted passageways before reaching the church and open square that stands at the top of Coaraze. 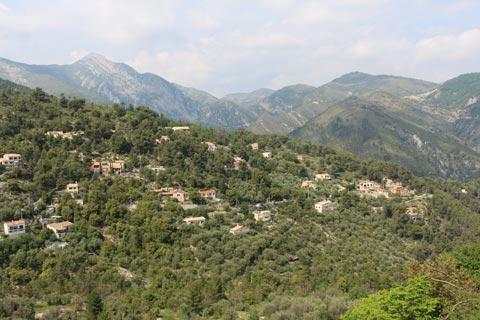 The views that await you at in the open square next to the church and across the surrounding hills and olive groves from the square are especially impressive. the Church of Saint John the Baptist. 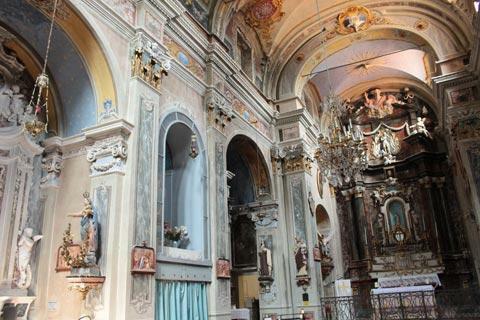 In the interior of this church you will find a very surprising excess of baroque decoration given the relative isolation of the village! 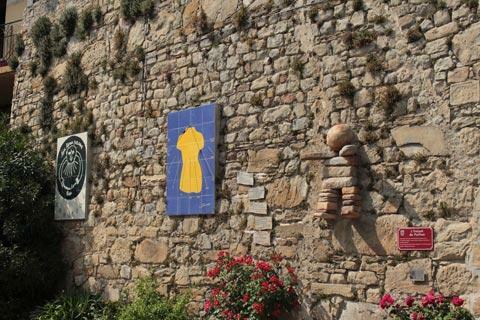 There are also several sundials in Coaraze to spot as you explore and some of these are the creations of famous artists such as John Cocteau. These sundials are very colourful even if it is not always obvious how to tell the time with them! The village continues to attract an active artist community. 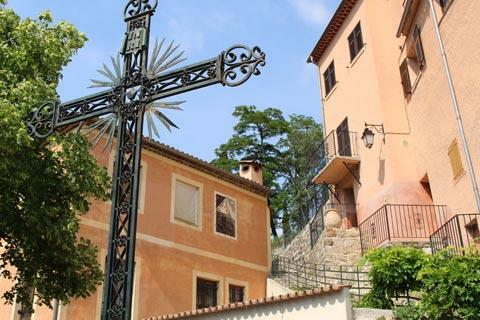 The mountains and wilderness of the National Parc of Mercantour are close to Coaraze and offer a wide range of opportunities for outdoor activities, from picnics and gentle walks to rock climbing and white water rafting. 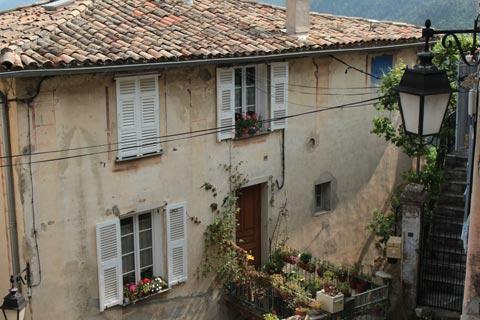 Between here and the coast you will certainly want to visit the villages of Peille and Peillon, both are lovely and the first is exceptional.